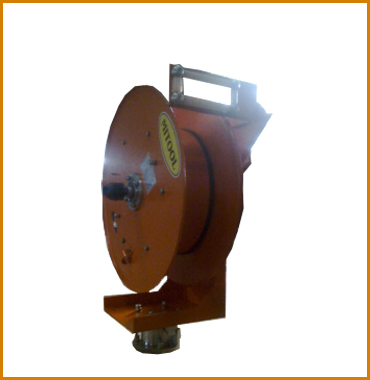 We are leading Spring Operated Hose Reeling Drum, manufacturers, suppliers and exporters located in Ambarnath MIDC Dist Thane, Maharshtra India. Mitool Make Hose Reeling Drums are generally used in Maintenance Shops, Garages, Works Shops and Industrial Application. In Spring Operated HRD's can also be supplied with Roller guide, Stopcatch to relieve tension, Swivel Base & L type Bracket as optional. Stopcatch :- A Spring Loaded Stopcatch which will work in any position allow cable or hose to be pulled from reel and then locks the reel with the required payed out length. When the hose is to be recovered back on the reel, a small pull is all that is required to release the catch. Stop catches are used on hand pull off dispensing or pendent reels and are generally fitted in conjunction with a roller guide. L type Bracket:- The Bracket accepts the mounting flange and allow the reel to be mounted to a horizontal surface such as floor or wall mounting. A number of accessories may be attached to mounting bracket and if stopcatch roller guide, swivel base or limit switch is required then a bracket must be fitted.